Maow Miniatures is an association dedicated to miniatures and games. The support for the professional and amateur sculptors by commissions and the production of their works. For the moment Maow Miniatures is only in french... but we manage to translate the site for the end of the year (we hope that). 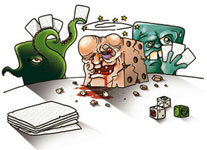 The english rules for the "MonsterDice die by your side" Game are now avalaible. It's a PDF file that you can download by clicking the cartoon below. You also need to downlaod special cards by clicking on the card next to the cartoon. We also sell only in France, mainly because the postal charges for other countries are very expensive...more than 9 euros for Europe and more than 18 euros for USA. But we try to find distributors in these areas.